It has been an interesting few days around this 95 year old house. If you recall, I've mentioned we've had furnace issues for a while now. We've been walking the tightrope for about a year now. Our furnace started making some noise a couple of years ago. We had it checked and the guy said it was the inducer, it costs around $600 and that it could probably go for a while but would eventually need replacing. We were contemplating replacing it at the time, but since the noise wasn't too bad, we figured we'd ride it out for a while. Well we rode it through last winter and by the end of the season, she was howlin' pretty good. When it fired up this fall, it was no better. It's weird how those things don't fix themselves with a little time off. Knowing that I would absolutely lose my mind if I had to listen to the roar of that thing for another season, we decided to have it "assessed." The assessment was that the patient was old, lived a good life but was on about stage 3 of a very expensive cancer. The inducer was now up to around $650, with a "failing main board" to the tune of another $700. If we fixed both of those we would have a patient with a new heart and brain, but a 21 year old liver with heavy cirrhosis scarring and a 21 year old gall bladder that caused heartburn. Oh, and it's appendix was about to burst. It was not a glowing bill of health. 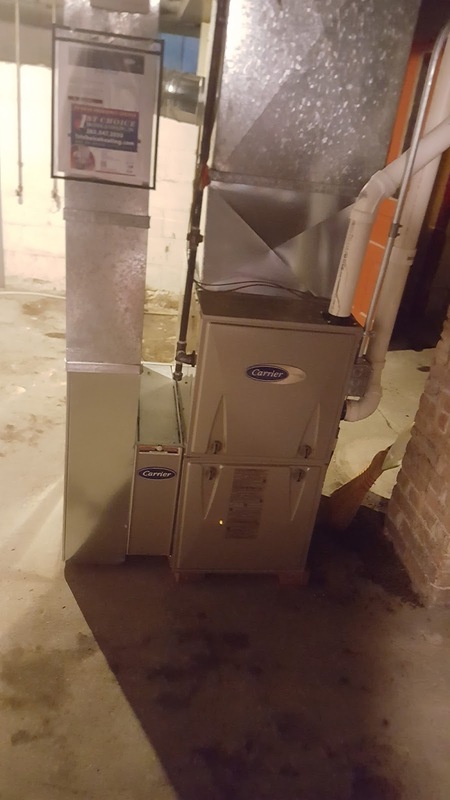 So we saw the writing on the wall and decided to bite the bullet and get a new furnace. When we sell the house in the next 5-10 years, it will be a decent selling point. Yeah, that's it. The date was set for today back in November. That way we figured we'd nip any chance for a cold-snap disaster right in the bud. We got this. In true form, timing is everything. Yesterday when I woke, the furnace was acting up. It roared for a few minutes then powered down with no heat blown our way. Then, oddly enough it powered up again a minute later, howled for a few minutes, then shut off again. To make sure nothing tragic happened like a total failure and burst pipes, I stayed home and furnace sat. I holed up in an office with a space heater and worked. The thing worked on and off all day and into the early evening. So we went to bed and crossed our fingers. I woke at 2:30 because my nose was cold thinking something wasn't right. Checked the thermostat and it was at 56 degrees. I put the space heater on in our room, turned on the bathroom faucet slightly and went back to bed and thrashed around in bed like a heavily caffeinated meth addict. It was a bit like winter camping in a large wooden tent. A few hours-that-seemed-like-minutes later, I woke to the alarm. 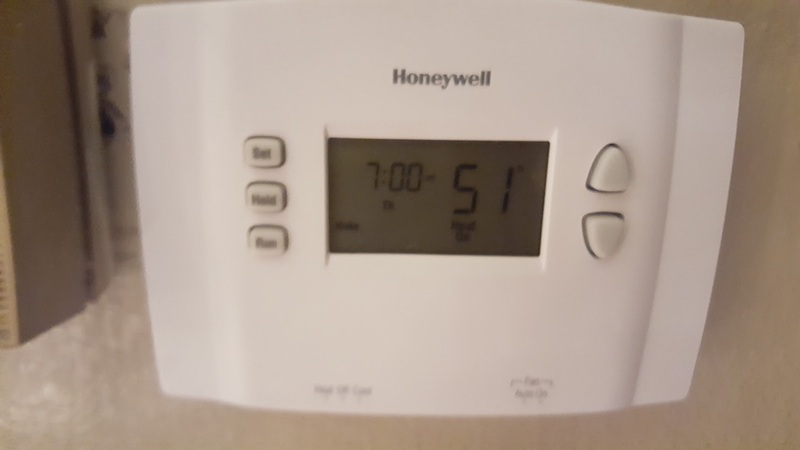 I went downstairs and saw we'd hit a new low of 51 degrees. Not bad...liveable, I thought. I fired up the oven like an urban hillbilly and went about breakfast and my routine. In the shower it occurred to me how much more steam gets generated when it's hitting 51 degree air. It's kinda purty. Our dog and cats were practically bedding down together to share the body heat. The installers were supposed to show up at noon. True to form and fear, they were two hours behind schedule. Nonetheless, they got the new one in (not without having to replace one plumbing valve that was rusted open - Imagine that!) and were setting up the thermostat until we realized our wifi was out due to an area-wide outage. Doh! Well, at least we got heat. And I thank God for that.